I don’t know about you, but my feet could use some TLC before I slide on my flip flops this summer! The good news is it’s easy to get your feet summer ready without a pricey trip to the salon. It’s simple to do an at-home DIY foot soak to remove dead skin from your feet. So grab a book or turn on your favorite podcast, let your feet soak and treat yourself to a mini at-home pedicure! HOW DO YOU MAKE A DIY FOOT SOAK? It’s so simple to make your own foot soak. I love that any of these foot soak recipes can be customized to meet your individual needs or mood. All of these homemade foot soaks start with warm water. From there you can add salt, baking soda, vinegar, herbs, or essential oils for the perfect foot soak for you. WHAT IS GOOD TO SOAK DRY FEET IN? There are plenty of natural ingredients to choose from when making your own DIY foot soak. Epsom salt is a top pick for a homemade foot soak because it softens skin, helps to detoxify and relaxes tired muscles. Baking Soda is great for dry, cracked heels and perfect for an at-home foot soak. 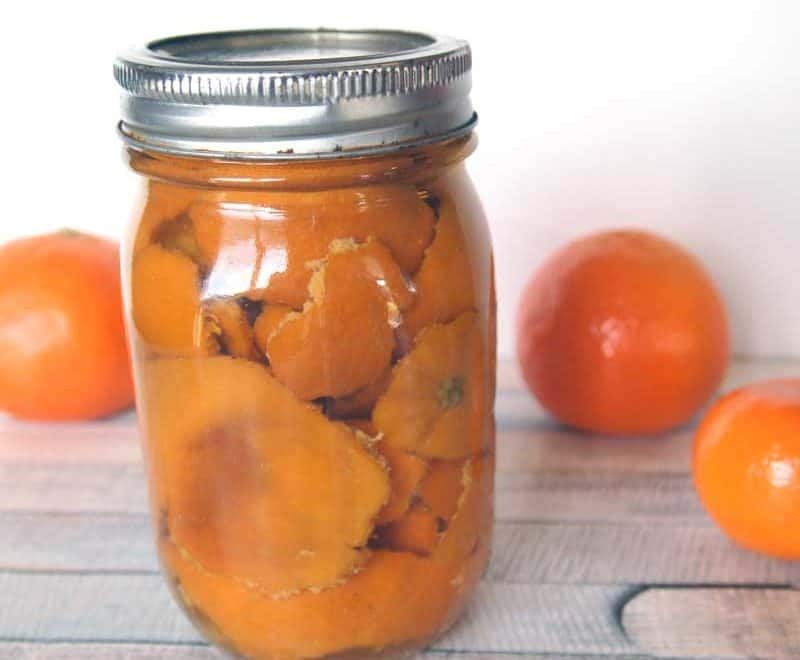 Vinegar softens dead, rough and callused foot skin while also packing a detoxifying punch. Even though I don’t love the smell of vinegar, I love that it can also be used as a detox foot soak. Vinegar also has antifungal properties, making great for any kind of foot fungal issues. Lemon is a powerful astringent that works to help soften dead skin. Lemon also has anti-fungal properties so it is great to use on anything for the feet. 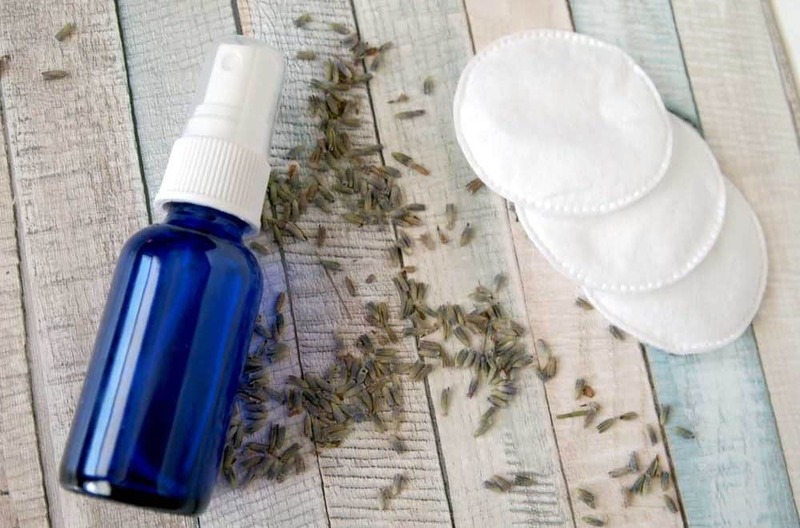 A variety of different essential oils can be used in DIY foot soaks. 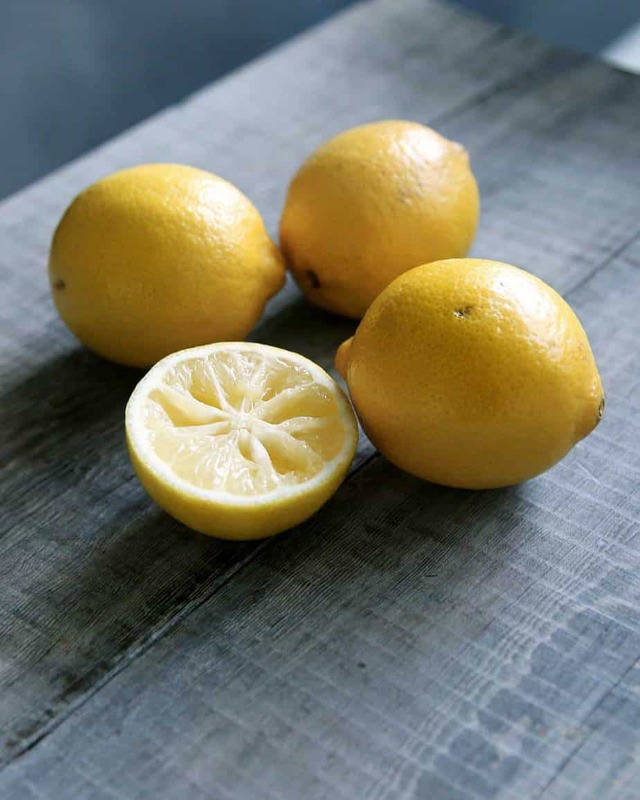 Lemon essential oil can be used in place of fresh lemon. Tea tree is great for feet because it has strong anti-fungal and anti-bacterial properties. WHAT IS THE BEST HOMEMADE FOOT SOAK? An Epsom salt foot soak not only softens skin, but also relaxes muscles and helps detoxify the body. Epsom salt is the perfect choice for a pre-bed relaxing foot bath. A Homemade apple cider vinegar foot soak is great to detoxify as well as soften skin. This one packs a strong essential oil punch and has nourishing oil included. Baking soda and fresh lemon juice are an unlikely combination that makes for an astringent foot soak with anti-fungal properties. All of these foot soaks soften dead skin and will help get your feet summer ready. 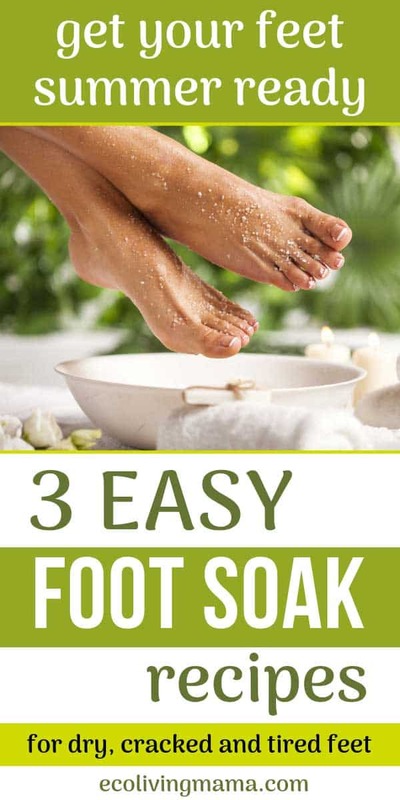 You can find ingredients to make all 3 of these foot soaks here. An Epsom salt foot soak is one of the easiest ways to relieve tired feet and improve dry heels. Epsom salt is loaded with magnesium, which is absorbed through the skin and helps to relax the body. This is a wonderfully relaxing foot soak to do before bed. Combine ingredients in a large bowl or basin big enough for both feet. Gently exfoliate heels with a small handful of Epsom salt once done soaking and rinse clean. For tough calluses or stubborn dry skin, use a pumice stone or exfoliating brush to remove excess dead skin. 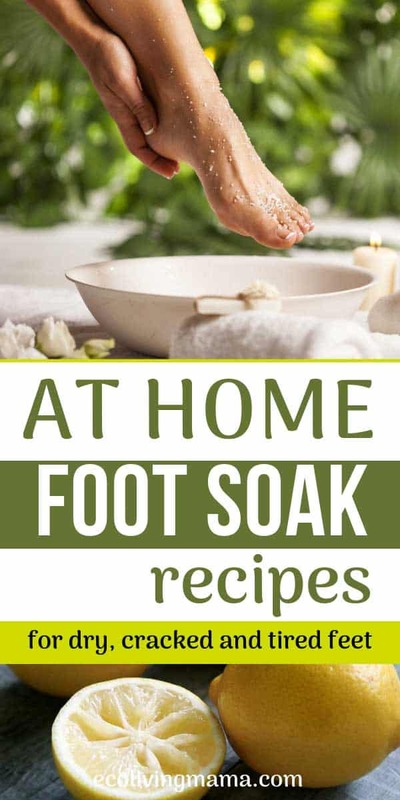 Looking for a homemade foot soak without Epsom salt? The next 2 foot soak recipes are for you! If you’re looking for a double-duty foot soak, this is it. Vinegar is great for a foot soak because it not only softens rough, dead skin, but it can also help remove toxins from your body. If you’re thinking that vinegar SMELLS and there’s no way you want to sit around with your feet in a bowl of stinky vinegar, I HEAR YA. This recipe uses some powerful essential oils to mask the vinegar smell, so you won’t have to hold your nose while your feet soak. Measure vinegar, oil and essential oils into bowl or basin large enough for your feet to be submerged in. Add enough warm water to cover your feet. Use a washcloth to rub dry skin off heels and rub off excess oil. Alternatively, you can use a body or foot scrub to help remove stubborn heel skin. 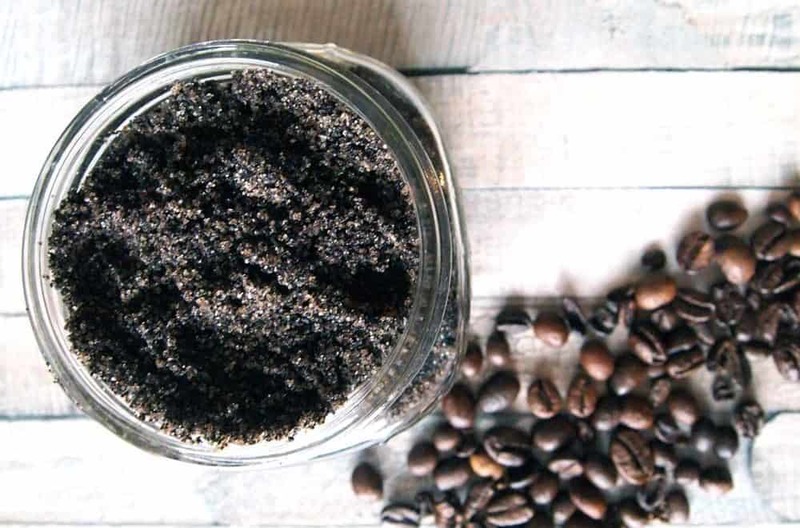 I had a jar of coffee body scrub available, so I used that to help remove dead skin from my heels. Doing your own foot soak with one of the recipes above is a great way to soften dead foot skin so that it becomes easier to remove. I’ve tested all of these foot soaks on my own callused feet and have not found ANY foot soak that removes dry skin completely without a little extra effort. 1 Make a homemade foot soak (pick from the 3 above) and soak feet for at least 15 minutes. 2 Remove feet from foot bath and exfoliate dead skin. You can use an exfoliating scrub (like this Himalayan salt scrub or homemade sugar scrub), a pumice stone or a foot brush. I’ve tried with only a washcloth and there was not enough scrubbing action to get the job done well. 3 Finish with your favorite moisturizer. I love these homemade lotion bars for feet because they are extremely rich and nourishing.